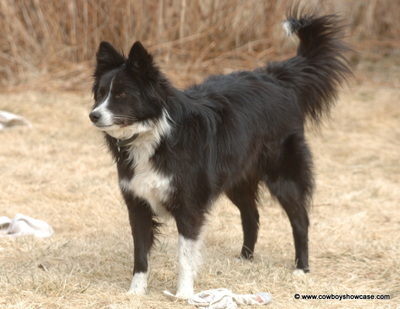 Cow dogs play an invaluable role on many ranches in the West and more than earn their keep. But two such dogs belonging to Mike Laughlin and Lee Raine went above and beyond their normal work when they undoubtedly saved the lives of both Mike and Lee. The dogs are Tip, a female Border Collie mix, and Taz, a male registered Australian Cattle Dog (Red Heeler), who was just eight months old at the time. The incident happened in August 2009. 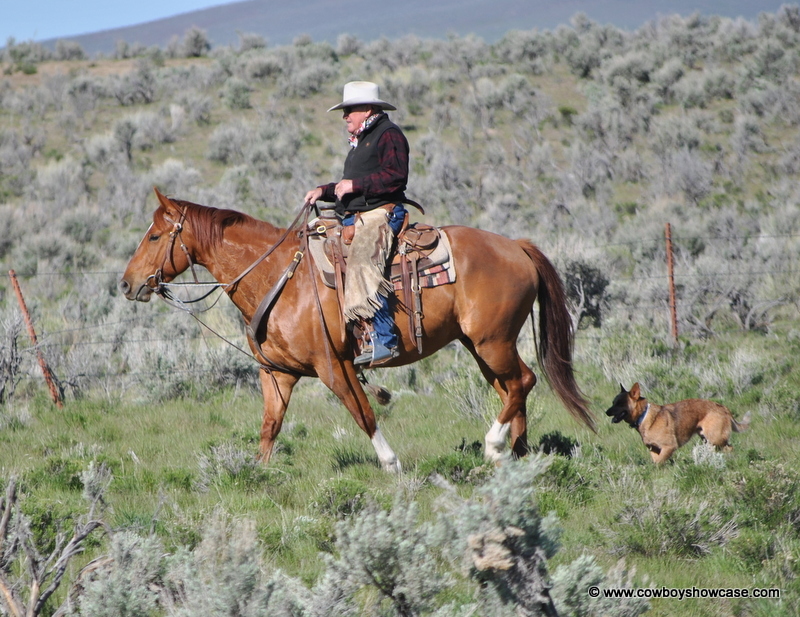 Even though Mike is on the shady side of 70, he likes to stay busy on horseback, handling and working cattle. For the past couple of years, he has been doing day work for the Maggie Creek Cattle Company Ranch out of Lamoille, Nevada. Day work, in ranching lingo, means that he's not on the payroll as a full-time employee, but works for the ranch when it needs extra help. Lee is also a sure-enough good hand with horses and cattle in her own right, and sometimes rides alongside Mike. pounds, was apparently in no mood to have anyone mess with him because as soon as he saw Mike, he jumped up and charged. Hoping to dodge the bull at the last second, Mike faced him head-on -- and got freight-trained. The bull’s head slammed Mike right in his sternum and sent him flying about 20 feet. Badly hurt, Mike could not begin to get up when the bull charged again and attacked Mike on the ground. For sure, Mike thought he had ridden his last roundup. Lee saw what was happening and started yelling, and she and the dogs ran toward Mike and the bull. When the bull saw them, he turned his attention from Mike and charged Lee. She tried all the bullfighting tricks she’d seen, like throwing her hat and trying to dodge him, but to no avail. He hit Lee from behind and threw her through the air. She curled up best she could, knowing the bull was still coming, but then realized he was not. Both dogs had sprung into action. They instantly attacked the bull and succeeded in driving him away from the battleground -- and kept him away while Lee helped Mike get up and to pickup. Lee loaded Mike into the passenger side, whistled for the dogs who jumped in the back, and headed for the main road as fast as she could travel on the rough, two-track road through the pasture. Mike was in excruciating pain, but never passed out. When they reached the main road, the ranch cow boss loaded Mike into another truck and sped toward the nearest hospital in Elko, Nev., 22 miles away. Lee and another cowboy took the horses and dogs home. It turned out Mike had all his ribs broken on the left side, a cracked rib on the right side, and a cracked sternum. He needed 14 stitches over the right eye and his left arm was hanging down, useless. After an MRI, it was found that the bull had torn Mike’s rotator cuff in the left shoulder. Although Lee was seriously bruised, she did not suffer any broken bones. N Mascara JHD NAC NJC HRD1-1 TT CGC CHIC-A. 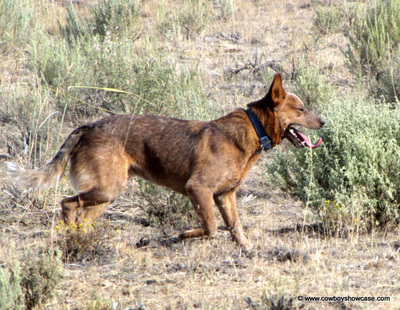 "Taz" posthumously received the 2009 Hero Dog Award during the 2010 California Cattle Call ACDCA National Specialty in Woodland, CA on Friday October 15th, 2010. Taz was killed by a cow in June 2010. This article by Pat Close appeared in Caesar's Way and Stockdog Journal Magazines.